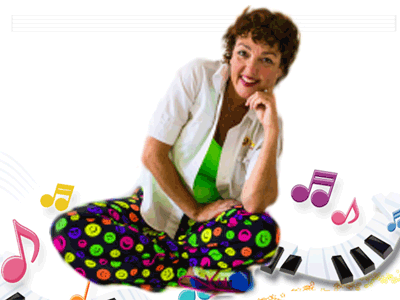 Suzie Sunshine will introduce your JK & SK students to the wonderful world of music in an engaging, fun-filled way. 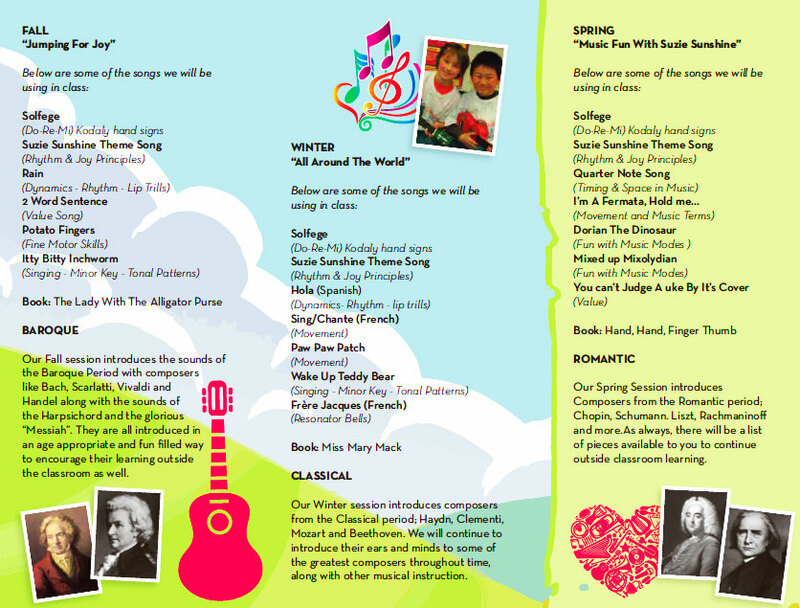 The program includes, singing, solfege (including Kodaly hand signs), rhythm, basic music concepts and “The Great Composers”. We include a lot of movement so be sure we have some space. 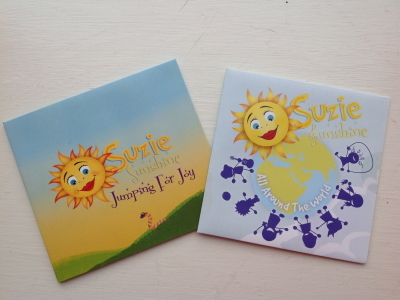 Music Fun With Suzie Sunshine is divided into three Semesters, each including it’s own CD of songs that we use with our rhythm instruments and a different period of music. This way you can have Suzie Sunshine back with a different program each Semester. 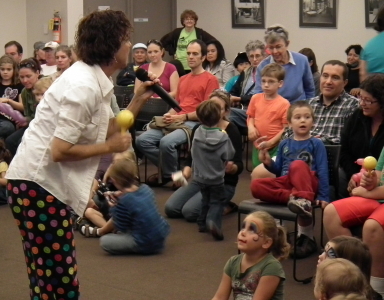 Music Fun With Suzie Sunshine is a great first step to having a wonderful experience with music for the rest of their lives! 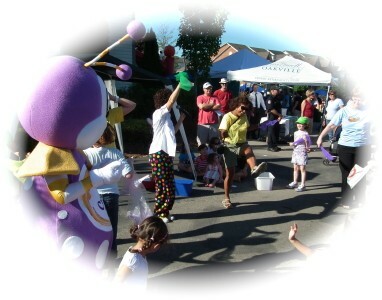 We can run the program in individual classes or with a large group. 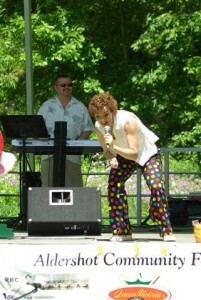 It is my immense pleasure to recommend Suzanne Brown for anyone seeking a source of sunshine and music in their day. As the Director of The Chartwell House Early Learning Centre, I am constantly seeking to acquire added benefits into our school which maximize our students’ experiences and support the areas of development which are crucial at these stages of life. Suzanne brings with her not only genuine enthusiasm and understanding of music, but also a respect and appreciation for children which alters her classes from being a mere musical experience to becoming a fruitful educational experience through which the children have a freedom of expression. I came to know Suzanne through the recommendation of a friend and after having met her, I became confident that her contributions to our school would be an asset. Both in and out of class, she had given me a strong impression and I quickly realized in my own observations that the wonderful rapport she held in the community, she also held with the children. In fact, throughout the week the children can be heard singing many of the songs which Miss. 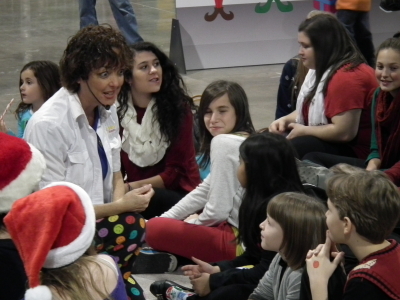 Suzie Sunshine has taught and they often ask if “Today is Miss. Suzie Sunshine day?” In addition to the passion she brings to our classrooms for music and dance, Suzanne is extremely unique in that she is willing to and has written her own music for the classes she prepares. In our conversations outside of class, Suzanne has displayed her knowledge and respect for children as individuals and is therefore extremely intuitive as to what their interests are. 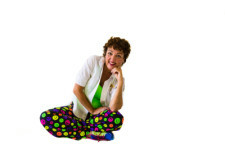 Suzanne places a great deal of thought and consideration into her planning for the children and provides engaging activities which teach the foundations of music in early childhood. She constantly collaborates with myself, our teachers and of course the students to ensure that the children are receiving the most beneficial experience possible. 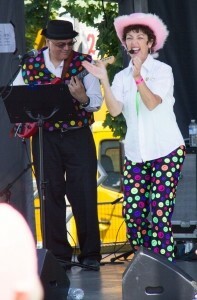 Suzanne’s colourful and wholehearted personality could not make interacting with music any more fun! 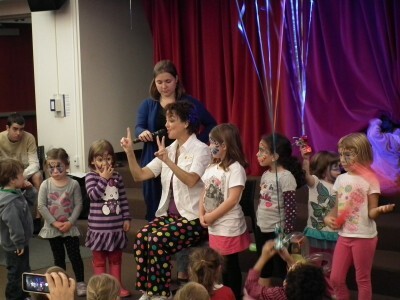 There is no doubt that we will continue to engage Suzanne Brown for bringing the colourful life of music into our classrooms. Suzanne is a true leader in her field and I am certain that anyone else who has the pleasure of experiencing the benefits which Suzanne brings with her, will walk away feeling just as elated and pleased in her contributions as we are. I eagerly give my endorsement of Suzanne’s skills and professionalism with the highest praise.